In our Strip Mall of the Month feature, writer Rico Gagliano picks a random L.A. shopping plaza and reports back on the hidden treasures found therein. 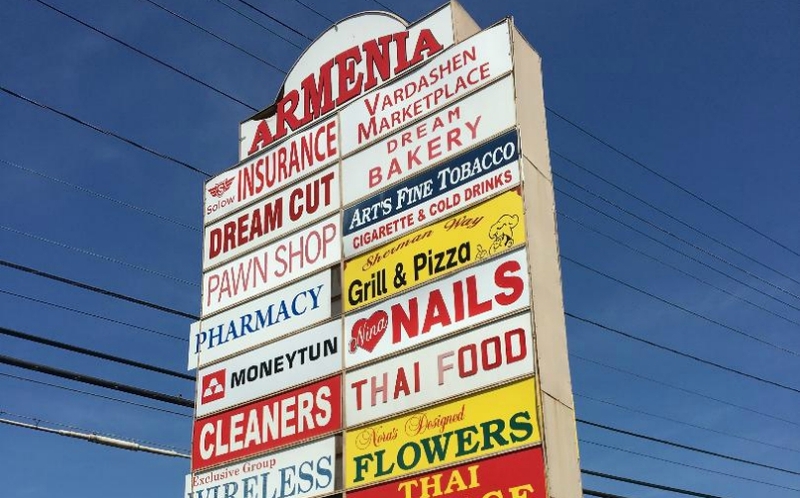 In true L.A. fashion, Armenia—the North Hollywood strip mall, not the country—sits smack in the middle of the Valley’s version of Thai Town. So while this mall does indeed house a slew of Armenian-owned establishments, a good quarter of the stores are Thai. And frankly, I had stopped by to check out those. Particularly the restaurant Bua Siam, which a Thai pal insisted serves the best tom yum soup in the city. That plan flew out the window the second I emerged from my car. Across the lot, at Dream Bakery, something buttery, comforting, and probably very bad for me had clearly just come out of the oven—the smell was amazing and demanded immediate investigation. Thai lunch could wait. My appetizer would be Armenian dessert. Foreground: Half-devoured gata, straight out of Dream Bakery’s ovens. Background: Racks of fresh-baked chorek, and more gata. Not pictured: The heavenly aroma. 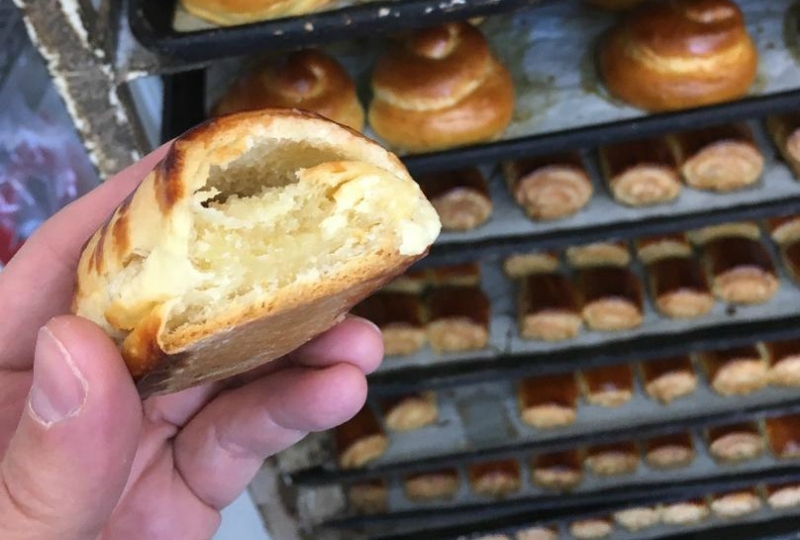 Dream Bakery opened back in 1993, after owner Bella Mesropyan followed her husband Kazar to L.A. from their native Armenia, and they found themselves missing the bread of their homeland. “My family loves bread,” she says. “We eat bread with bread. And back then there weren’t many Armenian bakeries around here that had that ethnic Armenian bread we were used to.” Like matnakash—“finger bread”—so named because bakers used their fingers to press patterns into the dough. True to form, I’m barely in the shop for two minutes before Kazar starts thrusting bags of treats into my arms, insisting I bring them home to my family, which he apparently assumes is enormous. There’s a sack filled with chorek, lightly sweet egg-enriched rolls available only around Eastertime. I’m also given a plastic bagful of classic meat-and-veggie-topped lahmajoun (an Instagram photo of which, Bella proudly tells me, got a like from Kim Kardashian). Finally, he wheels out a tall baking rack stacked with pans of piping-hot gata: crispy little squares of pastry filled with buttered sugar. They’re so fresh they burn my fingers and tongue, and I barely notice ‘cause they’re so freaking delicious. I scarf down three. But I came here for Thai food, remember? So after Kazar helps me load half the bakery into my car, I drag my now pastry-laden guts over to Bua Siam and talk to manager Steve Karschamroon. His parents took over the restaurant back in 2011—the fourth set of owners since the place opened in 1995. “That happens a lot in the Thai community,” he says. 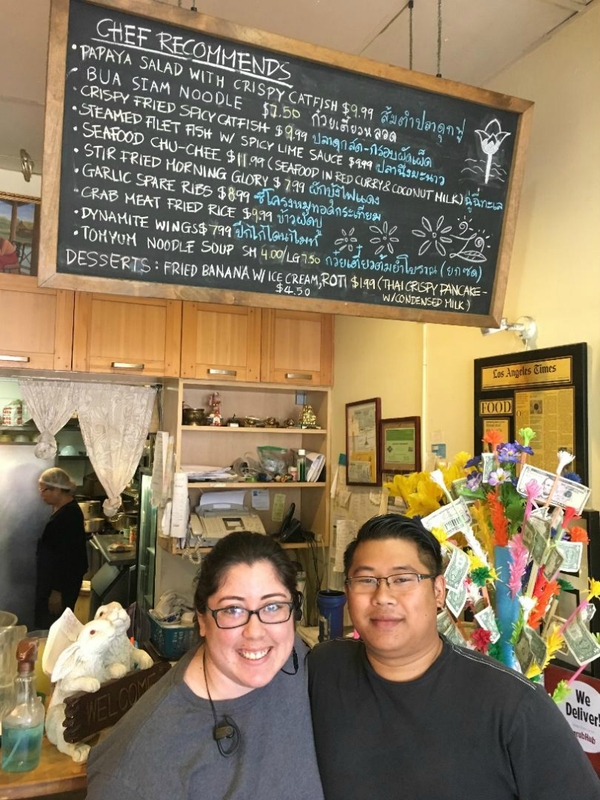 “When the owners get older or get married, they move back to Thailand and sell their restaurant. I don’t blame them; a lot of Thai people here are in the business, but that doesn’t mean it’s easy.” By way of example, he tells me about a storefront in the mall that went through three different owners in just a year and half—although one of its incarnations was as a shave-ice shop, which opened in the middle of winter. “That probably wasn’t smart,” he admits. You can see why a member of Zankou royalty would take a break from his own family’s famed fare to dine here. Bua Siam’s tom yum soup is as great as promised, and different than the versions found on most L.A. menus; instead of spotlighting chicken or seafood, the emphasis is on three preparations of pork. 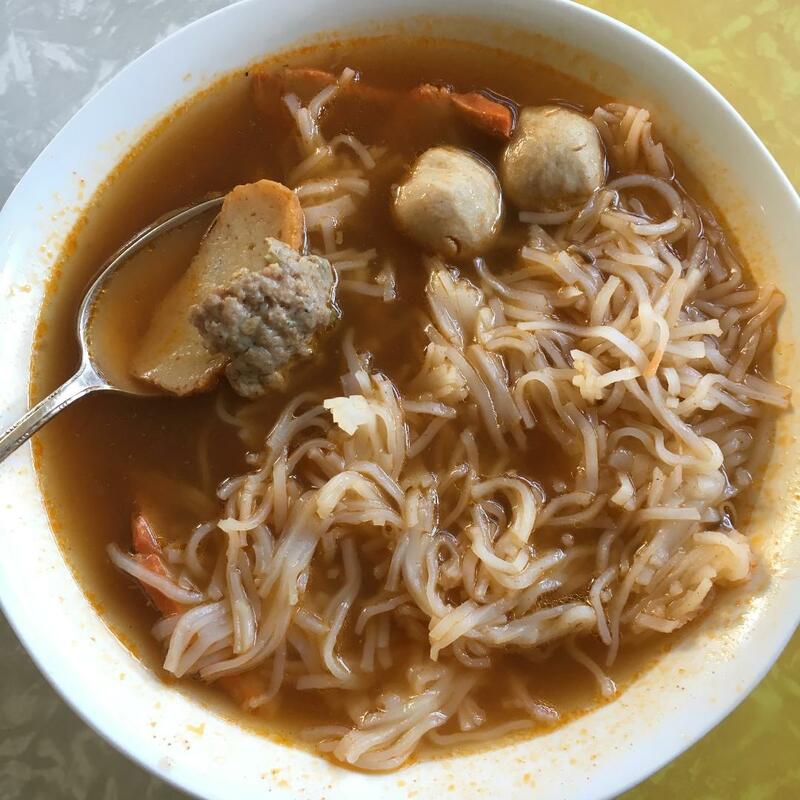 Into the sweet-and-spicy broth, alongside a big tangle of rice noodles, go roasted pork slices, a few light, almost spongy pork balls, and rich little ground-pork patties. Just in case that’s not enough umami for you, they toss in some fish cakes, too. Tasting it makes me wish it was 2011. Back then, to drum up business, Steve says Bua Siam offered free delivery almost all the way to my neighborhood—a 45-minute round trip. Alas, they’ve cut back to a saner radius. Maybe I should move to the Valley. So there it is: a white guy, surrounded by Armenian regulars, dining on Thai food alongside Asians eating Mexican. It’d be great if America was always as cool as Armenia. Parking lot: Decently large and navigable, but heed the nearly invisible signage that warns: “Spaces with red-painted stoppers are for ASSIGNED TENANTS ONLY.” I got chewed out by a shop owner for accidentally parking in her spot. Other nationalities represented: Sherman Way Grill and Pizza is Armenian owned, but the menu features good pizzas alongside kabob platters. So that’s Italian, kind of. On the other hand, you can also get tacos across the lot at Jack in the Box, and I guess you wouldn’t call that a Mexican joint. Westside alert: The Mesropyans just opened a second bakery, Once Upon a Dream, in a strip mall out in Tarzana. She says Westside resident Cher is a fan of the lahmajoun. Ed. note: This article has been updated to reflect the correct spelling of the finger bread matnakash.